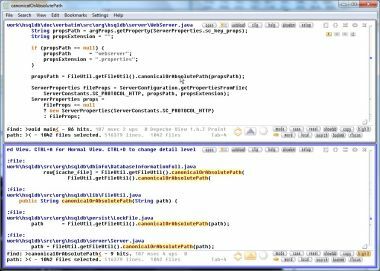 Depeche View allows high speed viewing, searching and editing of Java source code files. It loads all source files from a folder, showing them all in a single window, as if they were one large SuperSourceCode. 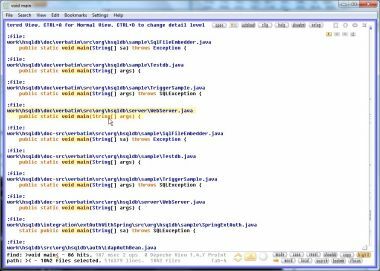 This radical and simple usage concept allows high speed search and analysis within thousands of Java source code files, tracking dependencies faster than with any Integrated Development Environment. 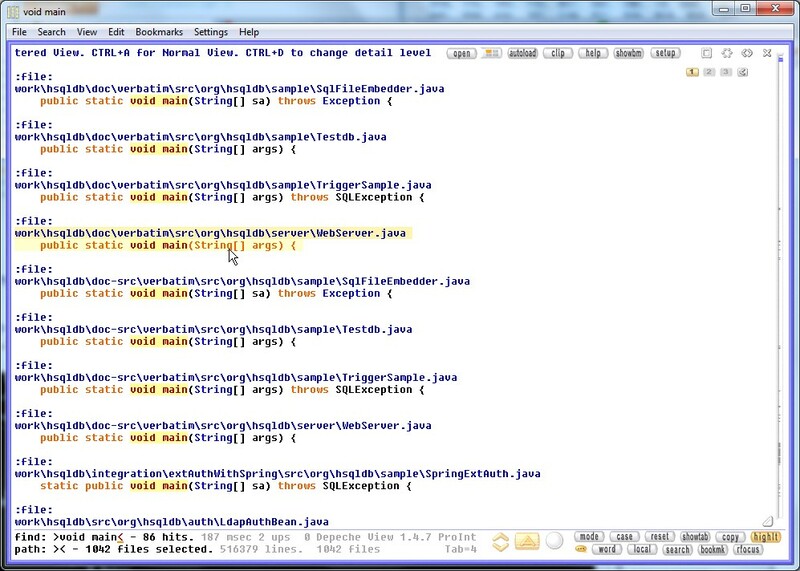 I want to get an overview over a Java database project, so I load all from folder work\hsqldb. Typing void main I get all program entry points, listed across a thousand files in 0.2 seconds (*) (on a 2.13 GHz i3 notebook). The screenshot shows a Filtered View result, activated by the filter button . 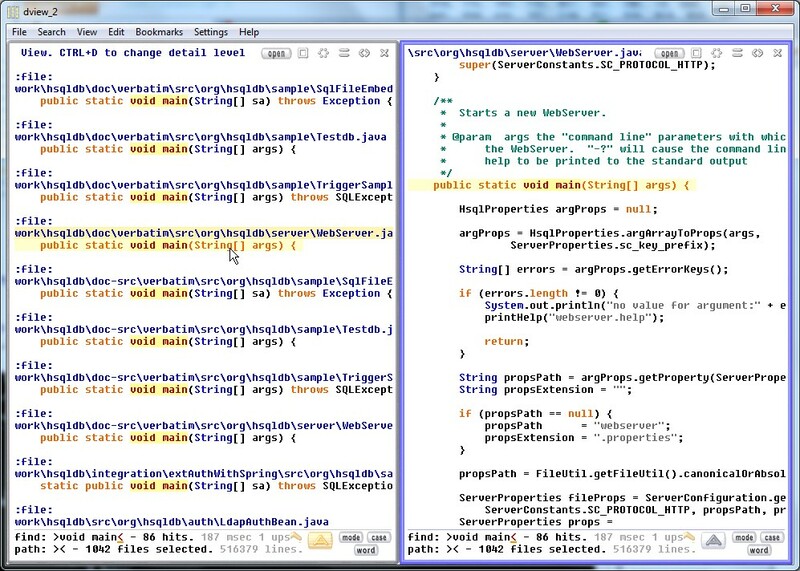 WebServer.java draws my attention. How is this web server implemented? One right click later, there is a second window showing that text location. and so I start surfing the code. What's the method canonicalOrAbsolutePath doing? I switch to horizontal tiling by a single F2 key press, and right click on that word. And so I may continue with further right clicks, ping-pong tracking dependies across the source. And whenever an important place in the code is found, a double click (or optionally single click) enters editing mode, allowing to change the source code at that place immeditately. 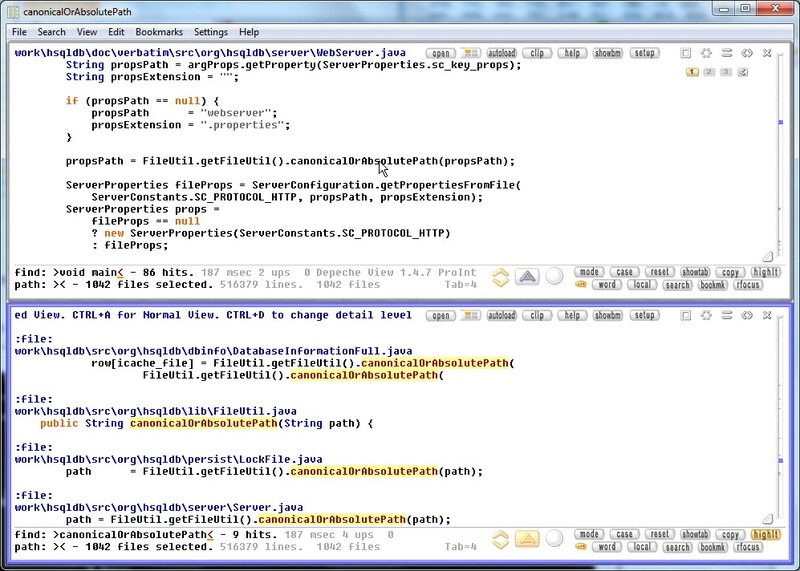 Depeche View Pro comes with built-in syntax highlighting for Java source code. 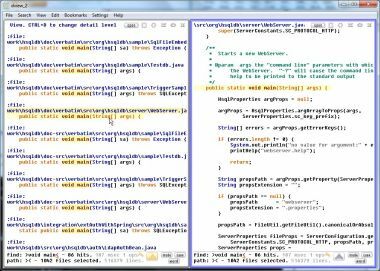 The highlighting can be adapted or extended through a configuration file with straightforward syntax. See an example here. (*) Please note: the search time given above is an example and may vary by factors, depending on the hardware and search expression used. For example, longer words are found faster than shorter words, as they normally produce less results. Try it yourself. 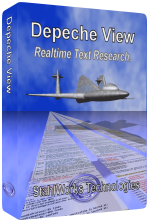 Get the Depeche View Pro Demo, load a Java project and fly over thousands of source code files.